A delicious annual vegetable, cucumbers, Cucumis sativus are grown in many parts of the world for use in salads, soups, dips and as pickles. They are a member of the squash family, Cucurbitaceae, along with melons and pumpkins. There are two types of growth habit: Vining forms grow to 4-8 feet; bush varieties are just 2-3 feet long. Both have rough, ivy-shaped leaves, clinging tendrils and bright yellow flowers. The male and females parts of the plant are in different flowers, so the presence of pollinators in the garden in important. Grow in full sun. They like fertile, well-drained soil and plenty of water. Mulching helps soil retain moisture and stay cool. Why Do Cats Hate Cucumbers? Plant in spring in mounds spaced 12-18 inches apart, with 2 to 3 seeds per mound. In short season climates, start seeds indoors 4 weeks before last frost. For vine types, provide a trellis for support. Most varieties are ready to harvest in 60 to 80 days. Pick fruits regularly to keep the vines productive, ripening fruits left on the plant will cause it to stop blooming. 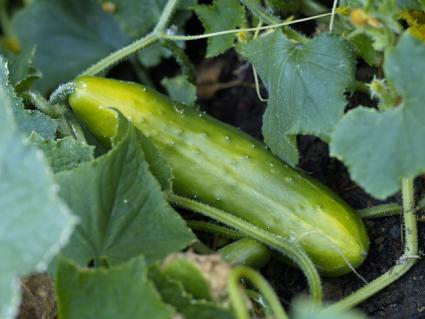 Cucumbers are vulnerable to cutworms when they are small. Protect them with cardboard collars buried 3 inches under the soil. They can be made from milk or juice cartons sliced in half horizontally with the top and bottom removed-each carton makes two collars. If slugs are in issue in your area, put out non-toxic slug bait or surround plants with a copper strip or diatomaceous earth. Cucumber beetles are another predator. They are striped or spotted and can carry plant diseases. You can check plants early and often, picking them off by hand. Or use row covers to protect your plants, but be sure to take them off for a few hours each day once plants begin blooming to allow pollinators access to the flowers. There are also traps available that use pheromones to attract the beetles. Mildew and viruses can affect the plants. Mildew appears as a white, powdery coating on the surface of the leaves; virus infected plants will have discolored and deformed leaves. Rotate crops to prevent these problems, and choose resistant varieties. Including flowers such as marigolds and yarrow among your plantings will help attract beneficial insects that will prey upon the beetles. The plants can be grown in the vegetable garden or in containers. They need less space than other members of their family, so they are a good choice for small gardens and patios. They can be an attractive part of an edible landscape. The quintessential hot weather dinner is a salad of fresh, cool cucumbers with a yogurt dressing. There are many recipes for such dishes of Middle Eastern and Eastern European origin. Dill and garlic also pair well with cucumbers and can be used to flavor pickles. To can, pick fruits before they mature, when they are at a uniform size.